Suitable for all levels – if you can read music a little bit but aren’t very confident it’s the perfect environment to try playing with others. On the other hand, if you are looking for a challenge we provide that too! We try and match similar abilities wherever possible. It’s a great way to meet fellow players and learn new skills. The day will include:The day is open to all. However if you are under 16 and would like to attend please contact us before booking to ensure we can cater for you. Short concert to which friends and family are warmly invited. Please bring a music stand! There will be an informal concert at 4.15 pm. If you would like friends and family to come along they are very welcome – please ask them to arrive during the break at around 4pm. Lunch is not included. Bring a packed lunch. Drinks are provided free of charge at the breaks. 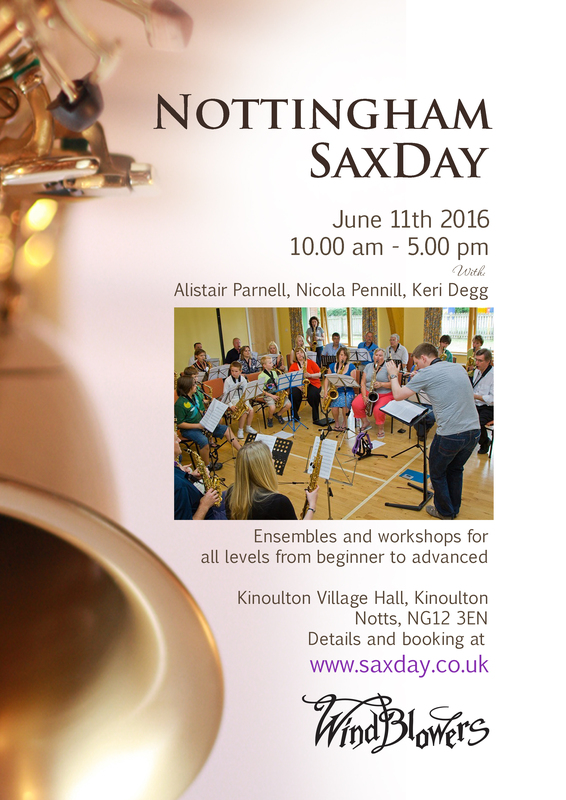 At previous Sax Days, players have been keen to get answers to particular technical issues, get guidance on how to practice, or just have a chance to get feedback on their playing. Following the popularity of this option last year we are offering a limited number of short lesson slots which will be allocated on first-come, first served basis. On the booking form please indicate if you would like to take advantage of this and indicate the broad area you would like to focus on. This will help us plan the day. On the day there will also be additional workshop sessions, details to be announced soon.